Newkirk Center hosted a panel discussion on synthetic biology in conjunction with Traces of Vitality, an exhibit at the Beall Center for Art + Technology with works by artists Anna Dumitriu, Evelina Domnitch, and Dmitry Gelfand. Showcasing some of the most impressive women thought-leaders in the world today, i3 offered frank and insightful conversations with women who are sparking change in New York and across the globe. i3 is a unique way for women to connect to UJA and one another. Part of a three-year research project at Aarhus University entitled, "Posthuman Aesthetics," this conference addressed the aesthetic, ethical and biopolitical aspects of posthuman existence. Posthuman is a term that come to describe the various ways in which human existence has radically changed through technology. This one-day conference focused on the privacy issues created by the ubiquitous surveillance of smart cities. The conference analyzed how decisions about the balance between privacy and benefits of information processing are made and how they should be made. It examined the control we do and should have over our information, and the extent to which we could and should use technology and the law to gain greater control. Are Smart Cities a Smart Choice? discussed the benefits and risks of developing hyperconnected cities. Reaping Benefits, Respecting Privacy considered how we can design with adequate respect for privacy. Lori Andrews joined thinkers from the tech industry and academia to explore the intersection of technology and humanity, seeking to understand the risks and rewards of technology to ensure that we remain technology's master rather than servant. This meet-up discussed several projects at the helm of law and technology, including the Oyez Project and the Center for Computer-Assisted Legal Insturction (CALI). Lori Andrews discussed a recent policy paper, co-authored by Michael Holloway and Dan Massoglia, Digital Peepholes--Remote Activation of Webcams: Technology, Law and Policy. This paper discusses the law surrounding the remote activation of webcams by governments, companies, and hackers to spy on people without their knowledge or consent. The Chicago Legal Innovation & Technology Meetup is a group that aims to bring together Chicagoans interested in legal innovation, how technology can be used to improve legal services/access to justice, and legal startups. Goals include tackling current issues with the legal system, promoting the creation of legal technology solutions, and building community across disciplines. This CLE conference included both plenary speakers and three separate tracks of breakout sessions which focused on substantive law and trial advocacy skills. 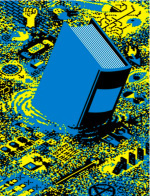 Lori spoke at a Chicago Association of Law Libraries (CALL) Meeting. Her talk, "How Social Networks Are Changing Our Lives and Our Culture," discussed how social networks are turning established legal rights upside down and how our digital identities are starting to overshadow our physical identities. Lori Andrews spoke to an "Internet and Society" class at Bard High School Early College. She shared the story of her career and spoke about her recent privacy work. This conference enlists its participant-attendees to join teams, each led by a different design firm, to get hands-on experience building a prototype solution for a community partner. Lori Andrews will open the conference with a discussion on privacy by design. 350 N La Salle St.
Lori Andrews joined Ed Lee and Anijo Punnen Mathew on a panel to discuss topics related to Creative Commons. Lori spoke on how Creative Commons principles are applied to science and instances of open-source biology. Lori Andrews discussed topics and resources related to Criminal Law and the role of the Public Defender. Andrews presented on Social Media and the Right to a Fair Trial, examining the use of new technologies and social media platforms in criminal prosecution and criminal defense. Lori Andrews joined leaders in industry, civic organizations and government to explore how design can address the complicated problems facing society and business. Her presentation, entitled Privacy by Design, focused on the ways in which design has encouraged and accomplished the protection of privacy. Lori Andrews spoke at the ASBMB's session, Career Choices: Roads Less Traveled. She discussed the ways in which science and law intersect in her work and the challenges that both of these fields face during the current period of rapid advancement in technology. Her talk was titled, The Road Not Taken. Lori Andrews discussed the effects of patent law on the past, present and future innovation. This conference, hosted by The Benjamin Franklin Project at the Illinois Institute of Technology (IIT) and the Massachusetts Institute of Technology (MIT), brought together leaders and experts from myriad disciplines. Other keynote speakers included Genevieve Bell, the Director of Interaction and Experience Research at Intel, Simona Maschi from the Copenhagen Institute for Interaction Design, as well as Historian Adrian Johns, Sociologists Paul Starr (Princeton) and Fred Block (UC-Davis), and Political Scientists Laura Hosman (IIT) and John Zumbrunnen (UW-Madison). On Friday, April 4, as IIT Chicago-Kent College of Law in partnership with UIC School of Public Health brings together medical app developers, lawyers, regulators and health care professionals to discuss privacy and policy considerations for a public increasingly dependent on "Health on the Go." The conference will discuss the laws and regulations dealing with the collection and use of health information outside the health care system. It will also address current federal and state investigations into data aggregation and medical apps. The digital world presents new opportunities to improve your health. It's now possible for your every movement, every intonation in your voice, every phone call you dial or receive, and every website you visit to be tracked, documented and analyzed to create your health profile. From maximizing your personal health and identifying public health trends to fueling a new sector of the economy, health information from apps, social networks and games is shaping our lives. And as our digital health data grow, the need to address the legal, medical and social implications becomes increasingly important. "Facebook Nation: How Social Networks Affect You Personally and Professionally"
Lori Andrews will present a CLE presentation, "Facebook Nation: How Social Networks Affect You Personally and Professionally," to the Bohemian Lawyers' Association of Chicago at their February meeting. Live violin music will be provided by Peter Herz. Association membership may be required. Lori Andrews will join Chris Holman and Andrew Chin to talk about the future of genomic law and policy in a panel discussion. Her presentation, "How Did Gene Patents Get to be a Civil Liberties Issue?," will explore the U.S. Supreme Court decision in Association for Molecular Pathology v. Myriad Genetics, Inc. in greater depth. This conference is centered around two recent Supreme Court decisions which address the legal uses of human DNA: Maryland v. King and the Myriad case. Lori Andrews participate in a panel discussion of the Myriad case which was heard by the Supreme Court this past summer. Debra Greenfield, Institute for Society and Genetics, UC Los Angeles; Dan Burk, UC Irvine School of Law; and Dr. Mildred Cho, Stanford will join Lori Andrews on the Myriad panel. Lori Andrews discussed her recent literary works, how she entered the field, and what is coming up next in her writing career. Books & Brunch is an annual fundraising event for the Assistance League of Chicagoland West. The Social Network and Innovation Conference drew together minds from many different disciplines to share current trends and research on networks, complexity, simulation, health optimization and privacy. 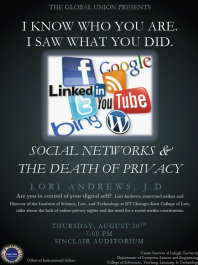 Lori Andrews presented "Social Networks: The New Research Frontier" as the 2013 Lewis College Invited Lecture. Her lecture explored the unexpected ways social networks are used (such as in employment decisions, in business marketing, law enforcement) and social network privacy issues. Lori Andrews moderated the final panel entitled, "Money, Privacy, Power and the Law." Its focus was to find ways to promote international cooperation for effective crime prevention and privacy protection. Other speakers on the panel included Robert van den Hoven van Genderen, Lynn Goldstein and Christopher Soghoian. Lori Andrews addressed reproductive endocrinologists, embryology specialists, and OB/GYN physicians on the topic of ethics in reproductive medicine. Abusive online attacks are a serious social problem, one encouraged by the frequent anonymity of Internet posts. There are legal and legislative solutions that will mitigate this problem and improve expectations about the level of derogatory online communications. The stakes are high because we rely on the Internet for much of our information, and our social interactions are increasingly electronic. Can we preserve the freedom of the Internet while curtailing some of its destructive excesses? Lori Andrews and Peter Baugher spoke during Social Media Week about the social and legal complexities of internet anonymity and the consequences they entail. Lori Andrews discussed internet privacy with NPR host Diane Rehm and guests Marc Rottenberg, executive director of the Electronic Privacy Information Center, and Jeff Jarvis, associate professor at the City University of New York's Graduate School of Journalism. Listen to an archived audio file of the show here. What Would the Founding Fathers Think of Facebook? The Founding Fathers who drafted the U.S. Constitution protected important rights - from the right to privacy to the right to a fair trial. But now, online social networks are creating an entirely new set of questions and challenges regarding our individual rights. Colleges and employers routinely reject applications because of publicly available information and photos found on social networking sites. Jurors post details on a case and ask their friends to vote on whether the defendant should go to jail. Marketing companies are facing lawsuits for allegedly collecting information about citizens based on our travels on the Web, without our knowledge or consent. Watch video archive of the event on C-SPAN 2's BOOKTV here. Listen to an audio archive of this even on WBEZ Chicago Public Radio here. A live conversation about Internet piracy and free speech that featured Lori Andrews, Pablo Chavez (Public Policy Director, Google), Clay Shirky ("Cognitive Surplus"), and Tim Wu ("The Master Switch"). This discussion was moderated by the New Yorker senior editor Nicholas Thompson. You can watch a video archive of the event here. In the wake of President Obama's proposal for a Consumer Privacy Bill of Rights for the Digital Age, IIT Chicago-Kent College of Law presented a national conference on Internet Privacy, Social Networks and Data Aggregation.The audience heard from leaders in the field who discussed how social networks blur the lines between socializing and advertising, how data is collected and used, what legal remedies have been most effective and what the future holds for consumers, companies and the courts. At the annual meeting of mystery and thriller writers, author Lori Andrews discussed how criminals and cops use social networks. Time and Date TBA. The Illinois Institute of Technology held a press conference for Illinois Governor Pat Quinn to sign House Bill 3782, which makes it illegal for employers to request an employee or potential employee’s social media account information, a recent trend among some employers. The governor was also joined by Lori Andrews, who spoke about the importance of this bill. Lori Andrews gave the keynote address and spoke about how Social Networks have and continue to created privacy concerns for Internet users. Lori Andrews spoke on a panel about US Privacy Law, with an emphasis on recent legislative, regulatory and litigation developments. Andrews, along with fellow panelists Trevor Hughes and Julie Brill and Thomas Smedinghof, focused on the anticipated changes in the privacy law framework in the US and those in the EU affecting US businesses. Lori Andrews spoke on a panel at the ABA Annual Meeting about 23andMe and Facebook, and how they change one's concept of privacy on the internet and in the doctor's office. The panelists also discussed whether new laws are necessary to protect one's privacy and what these law should provide. Does Your Internet Persona Have a Right to Privacy? Lori Andrews spoke on a panel with fellow author, Theresa Payton, about internet privacy, behavioral advertising, and data aggregation. They discussed their recently published books about the accumulation and abuse of personal information from social networks and the rest of the Internet, with focus on how the law, business and government interact to affect personal identity online. Are You in Control of Your Digital Self? Lori Andrews spoke to the undergraduate students at Lehigh University about the lack of online privacy rights and the need for a Social Networks Constitution. Lori Andrews addressed, to the undergraduate students at Susquehanna University, freedom and responsibility in the age of social networks. The Supreme Court IP Review is a conference designed to provide intellectual property practitioners, jurists, legal academics and law students with a review of IP cases from the U.S. Supreme Court's 2011 Term, a preview of cases on the docket for the 2012 Term, and a discussion of cert. petitions to watch. Lori Andrews, along with fellow panelists Arti Rai and The Honorable Paul S. Grewal and Jon Singer, discussed the case, Mayo Collaborative Services v. Prometheus Laboratories Inc. Location tracking technologies are becoming a pervasive, standardized feature of most electronic devices. Personal location data and smart navigation systems are predicted to offer $500-$800 billion in economic value to individual consumers and organizations over the next decade. The ever increasing use of geo-location data however, has raised national concern. 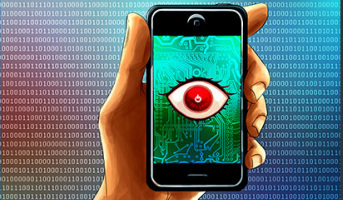 How can we realize the economic benefits while preserving sufficient privacy? IIT Chicago-Kent College of Law brings together noted leaders in the field who will analyze how decisions about the balance between privacy and the benefits of information processing are and should be made, examine what control we currently have over our information, and discuss the extent to which we can use technology and the law to gain greater control in the future. Lori Andrews spoke about the issues concerning Internet users' privacy that have been created by the rise of Social Networks, especially as it deals with women. Lori Andrews spoke about her book, "I Know Who You Are and I Saw What You Did," and the topic of internet privacy. Lori Andrews spoke on a panel about the various areas implicated by the rising use of social media. Lori Andrews focused on data aggregation and how what you do on social networks and other parts of the web is being digested, analyzed, and monetized. Lori Andrews spoke about the roles of advocates, scientists, and the public and how they played out in the case, Association for Molecular Pathology v. Myriad Genetics. Lori Andrews presented an overview of the forensic field, implications of the evidence, and how it can be used or misused by prosecutors and the general public. Lori Andrews gave the keynote address at this conference, which was simultaneously translated into Chinese. Lori Andrews spoke about the concerns raised when information people post on social networks are used by employers, health insurers, life insurers. She also talked about how biotechnological developments influence individual rights in health care and human rights. Lori Andrews talked about direct to consumer genetic testing websites, such as 23andMe, and about the issues related directly to patents, copyrights, and trademarks that these websites and other social media websites raise. Lori spoke to faculty members at the University of New Mexico School of Law about internet privacy and social media and about the subjects in her book, "I Know Who You Are and I Saw What You Did." Lori discussed the topics in her book, "I Know Who You Are and I Saw What You Did," to graduate students, faculty, and staff at DePaul University. Lori Andrews discussed how the courts and legislatures in the past have addressed the fundamental right of privacy with the advent of new technologies, but have failed to do so for cases about social networks. Lori analyzed the ways in which people's privacy is being invaded online and will argue that stronger privacy protections are necessary in this age of social networks. 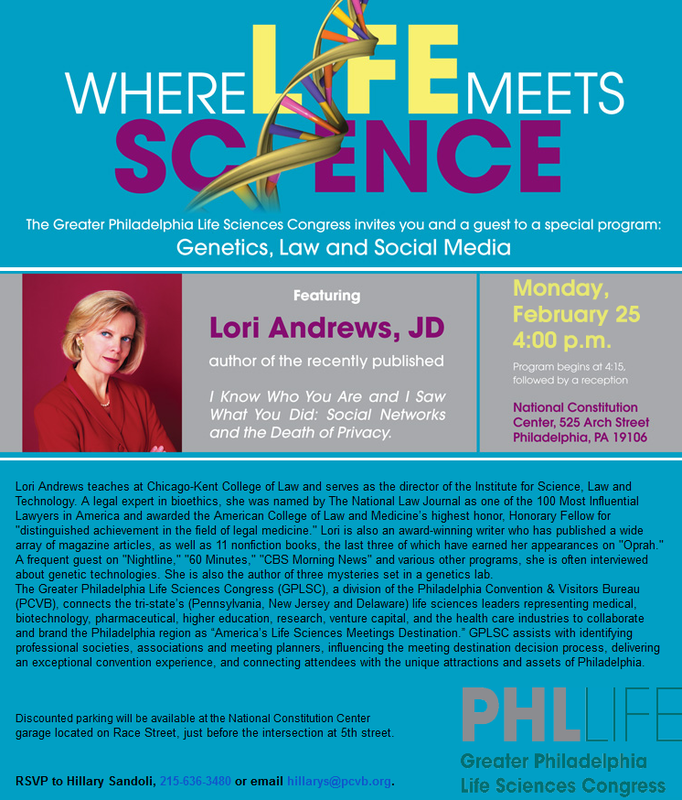 Lori Andrews talked to members of the Philadelphia life science industry and local medical and life science students at the National Constitution Center. She talked about her work in bioethics and the topics in her latest book, "I Know Who You Are and I Saw What You Did: Social Networks and the Death of Privacy." During this conference, Professor Lori Andrews discussed how new digital technologies like social networks, spyware apps, GPS tracking, and etc. provide a way for social institutions to peer into the private space of family members like never before. Privacy Piracy with Host Mari Frank, ESQ. Lori Andrews will discuss social network addiction, employers' use of social networks, internet privacy, and other topics with host of "Privacy Piracy," Mari Frank. The interview will air on KUCI 88.9 FM in Irvine, CA, and will be streaming online on Monday, May 6, 2013 at 8 A.M. to 8:30 A.M. (PST). Lori Andrews will speak on the service panel, "Found in Translation: Sending Messages Outside the Academy Walls," about her experience writing works of fiction using insights she gleaned from her academic research. Lori will also be speaking on the "Health, Technology, and the Body Mini-Plenary" about how genetic services can exacerbate disparities in health care research and clinical services involving women.